I was asked to host a Geek Bar Session at Blogher '12 doing the Platform Tour of Blogger. I was kinda psched (OK, REALLY psyched) about this because after all the blogs I've designed, and all the work I've done on WordPress...I still have this little blog chugging along on Blogger, and I still LOVE Blogger! There are literally just a few things you should do when you start a blog on Blogger, that will set you up to have the most control should you decide to make the jump to WordPress. There are also a couple things that will just make you look a bit more professional should you choose to stay on Blogger. -I say buy your domain through a third party site. There's nothing wrong with buying your url through Blogger. It just takes a bit more drilling to get to your nameservers should you chose to move to self hosted down the road. It just comes down to easier access to your nameservers. -Run your feed through feedburner. Again, you have more control of your feed should you chose to move it. Export blog- is backing up your content. In my opinion this is the most important back up to do. I suggest saving this in a folder somewhere. I try to do it weekly. -One thing I always do with a Blogger design is hide the Blogger navbar. I just think it looks cleaner. You don't have to, but I like to. -When I say utilize your pages...it really just means don't load up your sidebar. Everything on your blog doesn't need to be on the homepage. Figure out what is really important to you, and figure out what can go on another page. 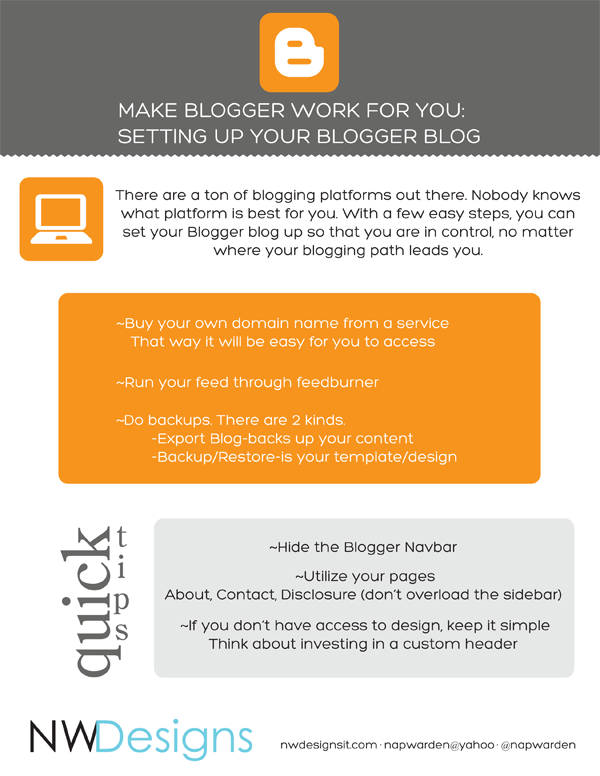 Be sure you have an about, contact, and depending on what kind of blogging you are doing, a disclosure page. -I know not everyone can invest the money in a professional design. When you don't know which way to go...I say default back to the old design mantra KISS (Keep It Simple Stupid) Keep it simple, and maybe look to invest in a custom banner. If you're going to BlogHer, stop by the Geed Bar and say "Hi"...and be sure to check out my work at NW Designs! Thanks - it's nice to have some tips on Blogger - I just lost my navbar! One comment though - I had to switch over from Chrome to Firefox in order to comment - if the comments are in the post like this, not in a separate window, Chrome just doesn't let you comment. Asinine, really, given that Google makes both Chrome and Blogger, but there you have it. I leave fewer comments than I might, because of that problem. The geek bar session with you was the highlight of my blogHer 12 session. Thank you so much for the one on one time. Looking forward to applying all that I learnt from you to my blog page.